Here he is: our Home Gnome. At least that's what I call him. When we were trying to sell our house in Fort Collins, our realtor here in New Jersey told us we needed a St. Joseph statue to help the house sell faster. We had never heard of such a thing but she swore that they worked. She bought us one and we followed directions for planting Joe in the ground, upside down in our herb bed back in Colorado. Ater a year went by and we returned to the house to do some repairs, we exhumed Old Joe to make sure he was pointing the right direction and we hadn't botched the burial. He was just fine, albeit a little dirty, and assuming the proper position. Poor Joe. All alone standing on his head for two years and he wasn't really the least bit of help. 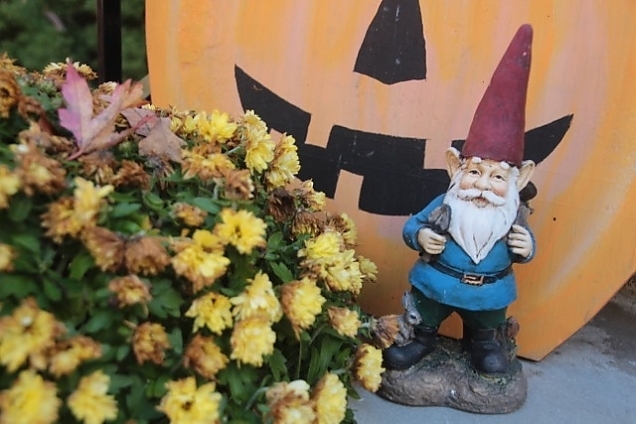 In similar fashion, Rick came home with this cute little gnome to help the sell the house. At least he didn't have to stand on his pointy head, but instead has graced our front porch right outside the door since he came home in late July. The people who put the contract on our house came to look at it in August. We didn't hear much from them except that they were still interested and "working on things" until they requested a second showing on Colombus Day weekend. Since then things have moved pretty fast. We couldn't be happier and hope that they don't sell their house too soon. We were here sitting out by the pool with the dogs when they visited the house the first time. They seemed like a really nice young couple and we could tell they were interested in the house. They asked a lot of good questions, and best of all, they noticed the artwork in the house and that all the canvases were signed by the same person — my Dad. Were were amazed that they had noticed. You have to be pretty observant to find his signature on all the paintings. Our estimation of them when up 100-fold right then and there! So, Mr. Home Gnome I hope you bring this contract to a sale! Did he really help? Who knows, but we like to think he did. Sidenote: I can't see or hear the word gnome without thinking of my dear Mom. She always pronounced it "ga-nomee." Makes me smile even today. I'm not sure if she really thought that was how you pronounced it or if she was just being funny. Bless you, Mom wherever you are. We miss you so. P.S. Follow the link to the St. Joseph statue above for the full story.